Beloved Bedlam: Things that came...and things to come! Things that came...and things to come! Last night we were putting the boys to bed...and Christian was like "do you hear that!" and I was like "what???" and then I heard this..
A Goat!! Sooo funny. 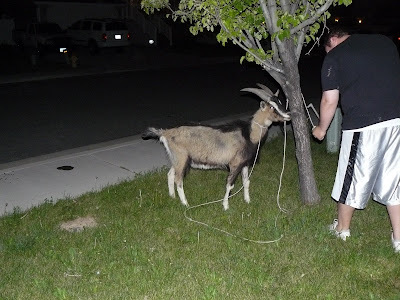 We tied it to our tree and tried to find its owner..
which actually made it funnier...Cause honey who calls 911 when there is a goat in your yard!? Finally the owners were located and they came for the little lady. 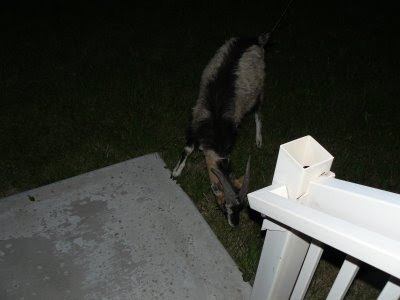 it was a nice goat...He then slammed the front door shut and locked us and the goat out. I found him asleep in his bed....sitting up..when I came back in. Well... we are adding another baby, or I should say sea monkey to our family. Yes....its another stinky little boy.. Yes, that is the 3rd time in a row I've heard "it has a pee pee"
No,...I am in no way disappointed. I really love my little men.. So spare me the looks of... "She must be soooo disappointed". I'm not! We feel so grateful to be blessed with children...Cute silly ones at that! A girl would add a little excitement to the mix.. this is true. still...and really does look like a sea monkey. I'm just hoping for another healthy bundle of love.. Isn't my scanning job awesome? Call me if you ever need help with yours! I love to share my talents. Congratulations! That is wonderful news. How exciting. Congratulations Jamee!! I'm glad someone is having boys to make up for all my girls. Well, this is exciting! Congratulations! Congrats you guys. OH and I am sorry about my goat getting out again! I will be better about keeping her on her leash! I am really, really excited! He will come really close to Kate's birthday. You gonna try for VBAC? I too once had a goat in my yard... and a turkey, a live one, not one in frozen cocoon, Thanksgiving was around the corner... never did see that bird again. Congrats on that new baby of love! Congratulations! We are super happy & excited for you guys! Congrats!! Brian and I are still laughing on how christian announced it. When exactly are you due? Now maybe your cute little boy can date our cute little girl!?! We really do want to get together soon! That's awesome - congratulations you guys! That is so exciting. Congrats!!! Senorita Berg. Porque no me dijiste de tu buena noticia??? Congrats anyways. I am so happpppppy for you guys! Congrats that is so exciting!!! I can't believe you didn't tell me when you were over her the other day. HELLO!!!!!!!!! I love that your post starts with a stray goat and ends with a new baby boy!! Hilarious!! CONGRATS! Jamee- Congrats..Oh, and boys are so much easier going. That's awesome! K The goat thing cracks me up..so funny! It's been a while since I've read your blog..You are the funniest girl. Congratulations! 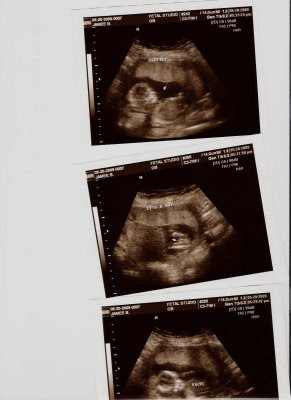 This is exciting...you will be having three little men. Enjoyed reading about the goat in your yard. 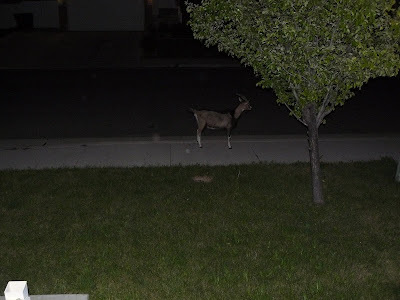 Next time you find a goat....keep it for a few days and put her in your backyard...she will eat all your weeds. You might as well enjoy her and make use of her. It's just part of the finders fee. Not kidding!